Personal & Company Branding: Is Your Logo A Shortcut to Communicate Your Brand Message? Thank you for the tremendous response on our previous post on logos entitled, “Which Comes First, the Logo or the Brand?” Here is a follow up: You must first know your unique value proposition, i.e., your brand message before your logo can become a communication shortcut for your brand. Getting your logo to succinctly and swiftly communicate your brand message directly to your target market is no easy task. But, when you get it right, as a luxury real estate marketing professional, it is unmistakable. We recently drove by a Jack in the Box and saw their logo in purple. We had to ask the question, “What were they thinking?” Upon investigation we discovered that the company created an additional logo. Their aim was to precisely communicate to a very important segment of their target market (obviously not us): Hungry night owls who get the “munchies” for fast food after 9pm. Their brand message: “We are open 24 hours a day and we have a special menu just for you called, Jack’s Munchie Meals™. Their purple color is an exaggerated mid-night blue that signifies “late-night”. Simply by changing their logo’s color they gave the symbol new meaning that is right on the wavelength of their ideal customer. This is brilliance in brand strategy! 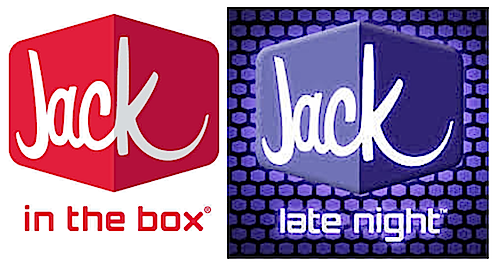 Once the target market understands the meaning of the purple logo Jack in the Box BECOMES not just another fast food restaurant in their minds, but THEIR late-night destination when they get the munchies. The ultimate goal in branding is to "OWN" your brand position, in this case "late-night". David Letterman is a personal brand that MEANS "late-night TV talk show host", not just "talk show host". It turns out that Jack in the Box is the long-term, late-night market leader. Their intention is to strengthen, leverage and capitalize on their leadership position. Luxury real estate market leaders, take heed! Is your logo a communication shortcut for your unique value proposition, your brand message?